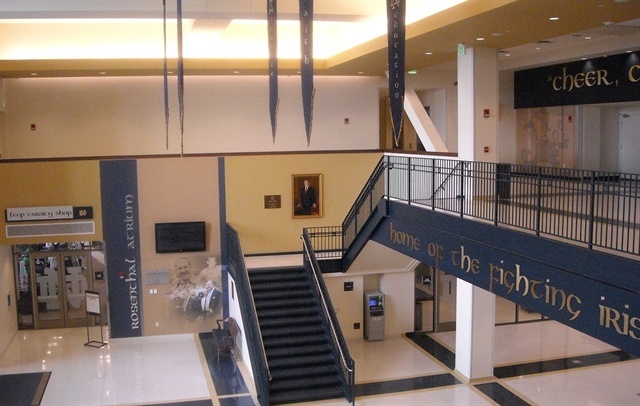 In 2009 the University of Notre Dame began a major remodel of its basketball arena at the Joyce Athletic Center. The arena underwent a $40 million addition and reimaging project, emerging as the renamed Purcell Pavilion at the Joyce Athletic Center. In planning the revised layout of the Purcell Pavilion, the athletic department had multiple goals including: (1) enhancing the fan experience with improvements such as new seats in the main arena and displaying historical graphics referencing the forty years of events at the center, (2) construction of a major structural addition for the main entrance adding meeting rooms and (3) improving the locker rooms and behind-the-scenes facilities. The concession stands were left untouched during the year following the remodel. The Hybrid Digital Display was the perfect solution to goals Dave had for the Purcell Pavilion concession areas! The additional time allowed Dave to contact Mainstreet Menus/Howard Company at the 2010 National Restaurant Show. 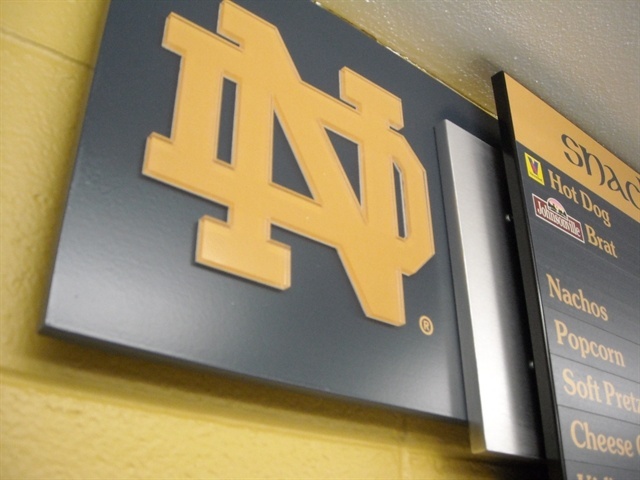 He outlined his goals, and following a survey of the remodeled Purcell facility, the Mainstreet Menus design team offered graphic options and menu board ideas which met both the Notre Dame Athletic and Food Service Department goals. 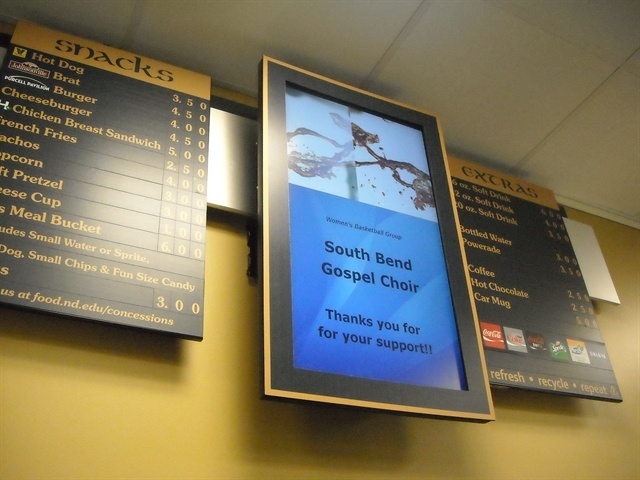 Following a review of initial designs, Notre Dame requested options to include video screens in the new menu boards. 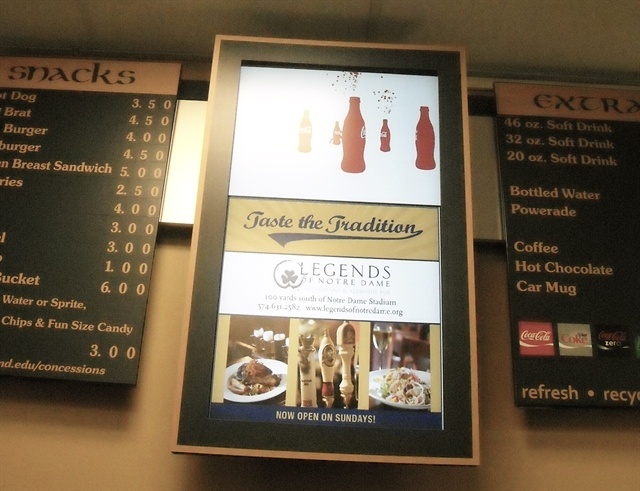 Prentkowski and Notre Dame had experience using stand alone digital menu boards from Mainstreet Menus the previous year at another concession stand in the Joyce Center. Dave’s major concerns needed to be addressed and solved. The ordering process, the speed of service and entire spectator experience were not enhanced with the use of all-digital menu systems. “The hybrid, combination boards were the solution to meet our needs,” according to Prentkowski. Be able to use video screens to promote upcoming athletic events to increase loyal spectator awareness. 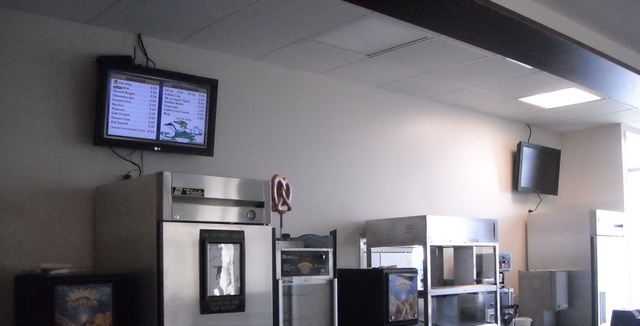 Promote food service specials using attention-getting graphics displayed on a video screen. Use the screens to promote other campus dining facilities as well as special events happening on campus. Promote awareness of, recognize, and thank the seven major sponsors of the athletic department in a subtle yet positive way. Begin the integration of information displayed on the digital panels of menu boards with the new jumbo scoreboard, a major part of the remodel project. Provide cutting edge technology and enhance the image of the food service/concession department and the University over all. The Mainstreet Menus digital product, VisionQuest, offered the perfect solution to meet the athletic and food service department goals. VisionQuest, along with a more traditional static board, presented a hybrid combination menu board blending the colors, materials, fonts and style with the new arena main concourse areas. Initially, more elaborate wall covering options were discussed for behind the menu board. It was decided to simply paint the walls to blend with the newly painted concourse areas. 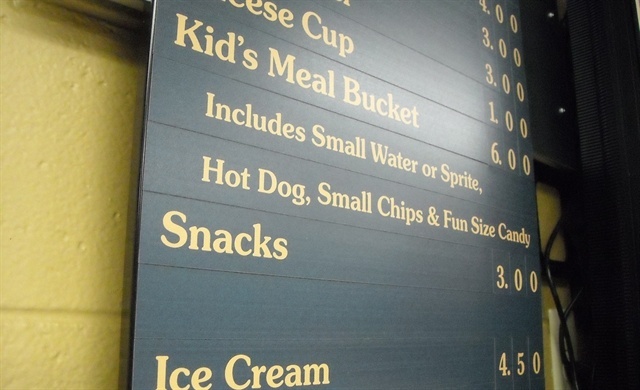 The hybrid/combination menu board became the focal point of the concession stands. The menu boards utilize magnetic, traditional panels to the right and left of the center video screen. The center video screen frame or bezel is enhanced and blended with the colors of the menu board and the arena. It no longer appears as a stark, plain, TV style digital screen. The menu board rear component utilizes the brushed metal colors found throughout the concourse areas in wayfaring signage. A dimensional ND logo reinforces the ND brand to the left of the menu panels. 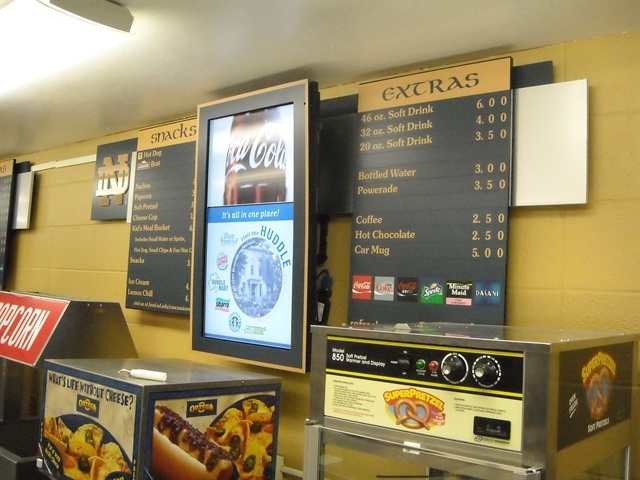 Combining the benefits of a traditional menu board approach with the enhancement of digital screens was the best and most economical way to meet all of the goals presented by ND athletics and food service personnel. Once the decision was made on the design and hardware, the implementation and installation process began. “Mainstreet did it right by getting all the people who would administer and use the system involved from the start,” said Prentkowski. The cabling and integration into the university’s network and wiring closets offered some unique challenges which were overcome quickly because key individuals were all involved and knew what was happening. New video clip development for product specials is ongoing. The staff is learning ways to integrate the concession stands’ feature panels with the new jumbo scoreboard in the arena. The seven major sponsors to the Notre DameAthletic Department have expressed their appreciation for the additional exposure of their brands and their prominent role in Notre Dame Athletics in clips running on the concession screens. The hybrid/combination menu boards featuring VisionQuest is a perfect fit for Notre Dame and meets the challenge presented to integrate concession stand designs with the new Purcell Pavilion in a fresh and outstanding manner.